Orchid Photography Contest, 2019 - 社区新闻 - 大西洋艺术在线 - Powered by Discuz!
" 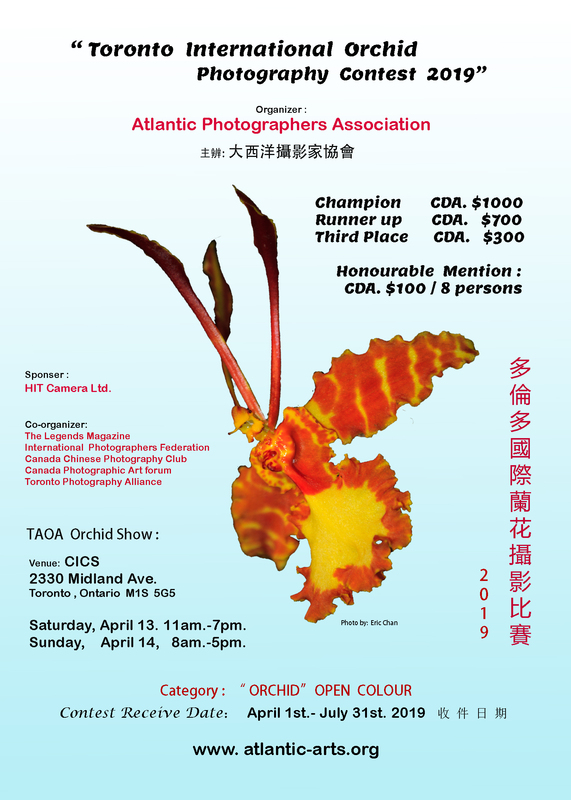 International Orchid Photography Contest 2019"
Sponsor: All prizes sponsored by HIT Camera & Video Ltd. Immigrant and Community Services, 2330 Midland Ave., Toronto, ON. Date: April 13, 2019. Saturday 11am.-7pm. / April 14, 2019. Sunday 8am.-5pm. and the art of photography. 1. Main theme or subject of the Photo Entries: Orchid(s). 2. Awards:	Given by HIT Camera Ltd.
All entries must be original and the contestant holds all applicable rights. RAW files required for all winners. Entries submitted before and after the Entry Period will not be eligible. (Or to the following email address: tiopcontest@gmail.com designated for the purpose, with the Submission Format (refer below). For each Contestant: The maximum number of entries for each contestant are five photographs. fees paid would not be refunded. a. Submission Fee : Cost for five entry (maximum 5 images) is CAD $20. photo entries and forward to them the invoice for the payment. adjudicated by the Judging Panel. 10, Appeal: The decision of the Judging Panel is final and no appeal will be entertained. 11. The announcement for winners will be on 1st Sept. 2019 at the website: www.atlantic-arts. All winners will be informed individually by E-mail. All prizes will be sent by mail. or unauthorized access to its servers. the disposal of APA and APA has the exclusive right of their usage. 14. Atlantic Photographers Association reserved all rights and explanation. GMT+8, 2019-4-23 08:07 , Processed in 0.079753 second(s), 19 queries .